Large panicles of double, lavender-pink flowers on a large, suckering shrub with dark green, heart shaped leaves. 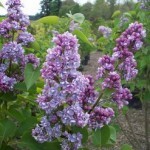 Blooms in mid-spring with that classic lilac fragrance. Like all French hybrids, prune after flowering. It prefers full sun and a well-drained soil.